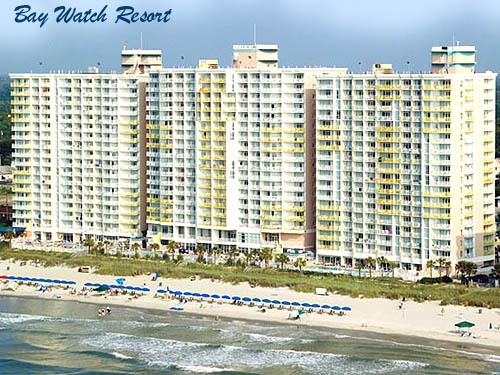 Located in the quaint, seaside town of Crescent Beach in North Myrtle Beach, the Bay Watch Resort is luxury defined. Thanks to its enrapturing, oceanfront location, visitors and residents of Bay Watch Resort can enjoy the white sand beaches, spectacular views and awe-inspiring sunsets of Myrtle Beach, often from the luxury of their own, private balcony. 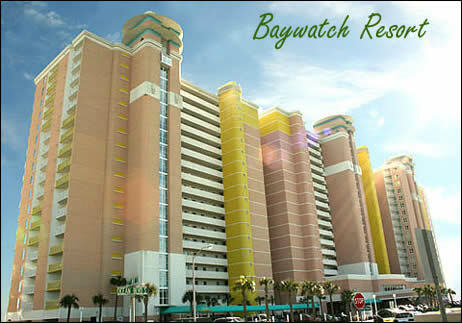 Read more about Baywatch Resort real estate. Built in 2001, the Bay Watch Resort features three, 18-story towers which rise from the windswept dunes of a wide beach. Two, three and four-bedroom condominium units are available at The Bay Watch Resort, as are a nice variety of luxury amenities,including a 600 foot oceanfront pool deck, an oceanfront pool, eight whirlpools, a lazy river and a kiddie pool. This new oceanfront destination also boasts great, on-site dining at the Blue Room Café, a casual spot for breakfast and dinner; the Fishtail Beach Bar, a fantastic, oceanfront beach bar featuring beer, wine and specialty frozen drinks; and the Sandtrap Bar and Grille, a sports bar and lounge which features daily drink specials and hors d’oeuvres. Other amenities include private beach access, fully furnished condominium residences, covered parking and conference and meeting space for banquets and meetings of any size. Luxury amenities include round the clock front desk service, a business center with high-speed Internet access, a gift shop and convenience store, a state-of-the-art fitness center, a game room and valet and laundry service. For more information on the condos at Baywatch Resort or any other Myrtle Beach condos for sale, call or contact us. We'll be happy to show you the beach!